In a wide-ranging interview, Lt. Gov. David Dewhurst talked about the state budget, education, immigration, water, transportation, and his hopes and plans for the legislative session that began this week. The Texas Legislature should prepare for a probable negative judgment in its ongoing school finance lawsuits by socking away money in the next budget to comply with a future court order, Lt. Gov. David Dewhurst said Wednesday. The lieutenant governor offered the proposal in a wide-ranging interview with The Texas Tribune about the state budget, education, immigration, water, transportation, and his hopes and plans for the legislative session that began this week. As lawmakers dispense with the ceremonial and administrative tasks of the first week of the session, budget leaders in both chambers are working on getting out their base budgets, first drafts of the two-year spending plan that lawmakers will work on throughout the remainder of the session. Dewhurst said the Senate’s base budget, which will be proposed next week, will include “$88 or $89 billion” in general revenue spending. He said the budget would include enough funding to account for growth in entitlement programs and public school enrollment, but said it would be based on the current public education budget and not on education spending patterns before budget cuts two years ago. A loud chorus of education groups and Democratic lawmakers has called for restoring the last session's school cuts as well as increasing the budget to account for the state’s population growth, a task that would require an $108 billion budget, according to the Center for Public Policy Priorities, a liberal think tank in Austin. The supplemental appropriations bill, needed to cover spending in the current budget, will initially total about $5.2 billion, Dewhurst said. That includes $4.5 billion to carry the state’s Medicaid program through the end of the year, with the balance being spent on health care in the state’s prison system and on money Texas unexpectedly spent fighting wildfires. It doesn’t include $1.9 billion to offset a public education payment delayed into the next fiscal year to balance the budget; Dewhurst said that would be included in the next two-year budget instead of in the supplemental bill. Ongoing school finance lawsuits have prompted predictions that lawmakers will have to punt on public education funding until the suit is resolved later this year. Dewhurst said he wants lawmakers to prepare for a ruling that requires the Legislature to put more money into schools by putting some money aside in the current budget for that purpose. “Based on my experience in 2006, in which the courts came back and said we needed to put several billion dollars more in public education. ... I’m saying it would be wise to leave some money,” he said. If lawmakers don’t plan ahead, the extra funding that the courts may mandate might force lawmakers to break the state’s spending cap, a move that requires support of four-fifths of lawmakers. Crossing such a hurdle would be difficult, if not impossible, Dewhurst said. While the exact details of school finance may be put on hold, Dewhurst said a broad suite of education reform proposals that includes school choice measures will get a serious look this session. The reforms considered will include testing, accountability and providing more educational materials online. “We are concentrating on a comprehensive reform of our public education in which we are trying to provide substance to the statement that we’re not teaching to the test, that we’re not testing our students too much, but that we’re testing them enough,” Dewhurst said. He said the state has more than 530 failing public schools with more than 315,000 students, and that school choice is a way to address that. Without saying “vouchers” out loud, he said students in bad schools should be able to move to public schools within their districts, in other districts and into charter schools. He talked about allowing more charter schools in the state and strengthening the state’s ability to close bad charter schools. Dewhurst also expressed support for allowing the state’s businesses to earmark some of their franchise taxes to go into a “scholarship fund” that would be used to send qualified public school students in failing schools to private schools, and mentioned a similar program in Florida as a model. Dewhurst also spoke optimistically about the Legislature getting serious about some long-term needs this session, particularly water and transportation. 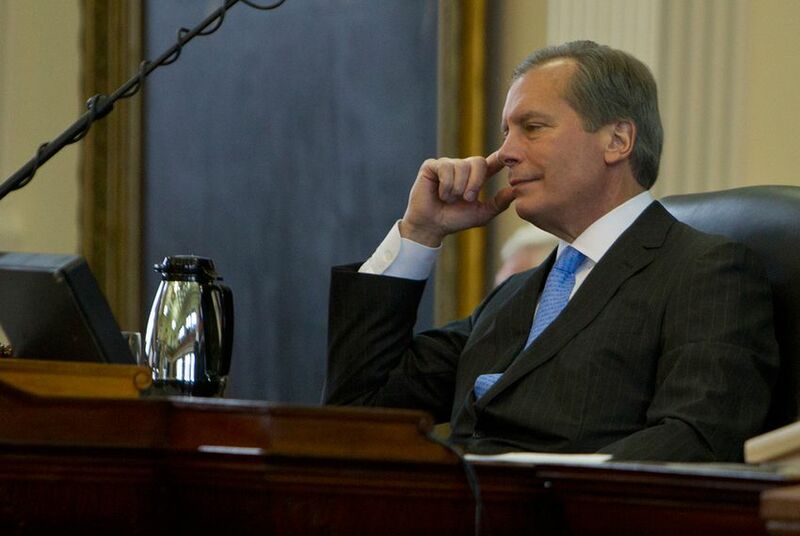 “I could be proved wrong in a month, and this is only my second day in this session, but I’m seeing strong willingness by Republicans and Democrats to focus on the big issues and get them done and to try and work together,” Dewhurst said. He said he had been working with the Water Development Board and others to produce a ranked list of projects the state should pursue. That’s similar to a “100 most congested roads” list that the Texas Department of Transportation now compiles regularly with the same goal — to keep regional officials from building local projects that aren’t state priorities. He has talked about taking $1 billion from the state’s Rainy Day Fund as seed money for water projects in Texas, but called that “a work in progress, and a number in progress.” Some water projects should be funded with bonds paid by contracts with water buyers; in other instances, he said, the state has to fund water resources now against growth that’s expected in the future. “The more of these projects that we can finance, the less actual costs are going to be paid by the people of Texas because in today’s market, long-term bonds are a lot cheaper than equity investment,” Dewhurst said. Transportation needs money, too, and without getting specific, Dewhurst said the state is “going to have to set aside some dedicated revenues.” He also said the state’s cities don’t have enough right of way to build the roads their growth will require, a suggestion that a boost in transportation funding doesn’t necessarily mean just money for more roads. On immigration, lawmakers aren’t likely to overturn a law allowing the Texas-raised children of illegal immigrants to pay in-state tuition when attending public colleges and universities in Texas, Dewhurst said. Though the Legislature passed the bill with nearly unanimous support in 2001, Dewhurst said he had some concerns about the “fairness” of the program, noting that it “crowds out” documented students from the state’s universities. That said, he predicted a repeal measure wouldn’t get anywhere this session. “I don’t think that bill has a one chance in 100 of passing because Gov. Perry will veto it,” Dewhurst said. Last year, in an on-stage interview at The Texas Tribune Festival, Perry said a repeal bill would never reach his desk but stopped short of vowing to veto it if it did. "Sanctuary city" legislation could make a comeback this session, and Dewhurst said “it only makes sense” to require police in Texas cities to check the citizenship of people they arrest, citing a federal law he said requires counties to do the same thing. He defended Comptroller Susan Combs’ two-year-old estimate of the state’s revenue, saying it would have been difficult two years ago for anyone to predict the improvement of the state’s fiscal health since January 2011 given that the state was just beginning to pull out of a recession at the time. He said it doesn’t give him any reservations about her newest forecast, released this week.